I Buy Way Too Many Records Dot Com: Not Wonk / The Full Teenz - Split 7"
I picked up this split 7" after really enjoying the two Not Wonk LPs that I had. 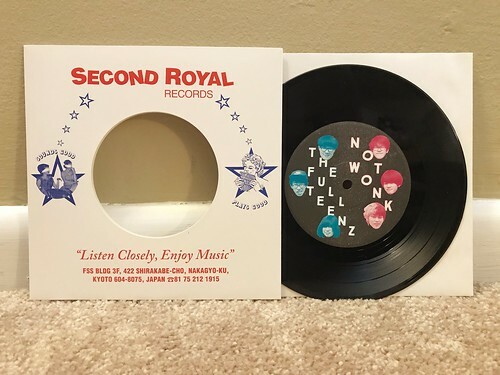 While I wasn't familiar with The Full Teenz, one of my favorite things to do is to buy a split 7" only knowing one of the two bands. It's lead to so many great discoveries over the years and I was hopeful this would be another. Not Wonk's side includes the song "On This Avenue." I already had that song on their second LP This Ordinary, but I'm not really all that great at remembering song names, so I didn't realize it until I played this 7" for the first time. Still, it is a really great song with a slower, Senseless Things meets 90s Brit pop style chorus. The other song they contribute is a cover of a Full Teenz song called "水彩画." I'm not familiar with the original, but the Not Wonk version is on the slow side and I can't say I like it quite as much as the song that they wrote. The Full Teenz side of this split is a lot of fun. The songs are upbeat and catchy, with a treble heavy reverb on the guitar tone. They remind me of another Japanese band called Popcatcher that I have a bunch of CD EPs from that I picked up in the late 90s. The Full Teenz was a nice surprise and I actually liked their side of this 7" better than the Not Wonk side. I'm going to have to see if they have any other records that I'm able to get my hands on.